This week on the ASC Podcast with John Goehle, we prepare for ASCA 2018 in Boston, discuss the latest news in the ASC industry and focus on Patient Satisfaction Surveys, complaints and the Grievance process. New Episode Available on Monday, April 9, 2018 but listen to all of our past episodes at www.ascpodcast.com. 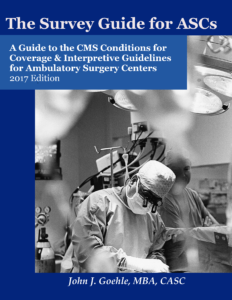 Special Offer for “The Survey Guide for ASCs – A Guide to the CMS Conditions for Coverage and Interpretive Guidelines for Ambulatory Surgery Centers.